5 signs that your parent or loved one needs a bed rail. Caregivers around the world spend millions of dollars each year on products and services that will help prevent falls in the bathroom, living room, and stairs. Unfortunately, one area of the home that many caregivers may neglect or forget about is the bedroom. Suprisingly, nearly 2 million people worldwide will visit the emergency room this year due to falling out of bed. Despite all the feather pillows, thick mattress, and shag carpet, a bedroom fall can be extremely detrimental to both the physical and emotional health of any senior. Bed rails and bedside handles can easily prevent a costly injury to your loved one. 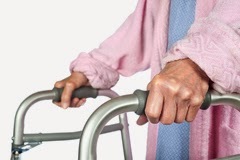 He/She uses a walker or cane - Seniors who use mobility products like walkers or canes are more likely to need a bed rail. Because these seniors lack balance and strength, a bed rail will give them a solid handle for getting in and out of bed, and will prevent them from rolling out of bed in their sleep. He/She suffers from Parkinson’s disease - Those who suffer from Parkinson’s disease are at a much higher risk of falling out of bed or falling while attempting to get out of bed. 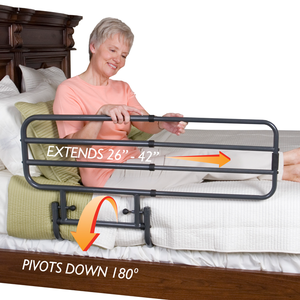 Due to tremors, arthritis, and loss of balance that comes with Parkinson’s disease, a bed rail will give added balance to your loved one as he/she gets out of bed at night or in the morning. Most importantly adjustable bed rails, like the EZ Adjust Bed Rail, will prevent your loved one from falling out of bed because of a tremor and can fold down out of the way when he or she needs to exit the bed. He/She has had a recent hip or knee surgery - Getting in and out of bed after hip replacement surgery can be a daunting task. 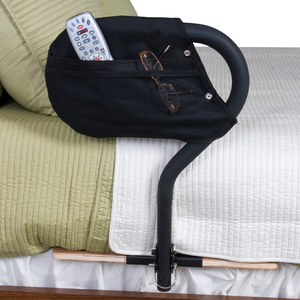 A simple bedside handle like the BedCane from Stander is a perfect solution for helping your loved one maneuver in and out of bed or even to help them find a comfortable position in bed. He/She has trouble getting out of sitting position - If your loved one struggles to get in or out of their favorite recliner, chair, or couch they probably also struggle getting out of bed. Having an extra handle or rail at their bedside will give them peace of mind knowing they can get up to use the bathroom in the middle of the night without hurting their back and without losing their balance. He/She has already fallen out of bed - Don’t chalk it up to chance or bad luck. Those who fall out of bed once are extremely likely to fall again. A bed rail is much cheaper than any surgery or doctors visit. Plan ahead and find a bed rail that will work for your loved ones bed and budget. Installing a bed rail will provide peace of mind knowing that your loved one is safe. It may also prevent a trip to the ER . Caregivers today have more bed rail options than ever before. Companies like Stander Inc. are re-inventing the traditional bed rails by providing your loved ones with attractive safety that doesn’t look out of place in the home. If your loved ones shows any of the warning signs above, it is time to make bedroom safety a priority in their home. Learn more about Stander bedrails (click on 2nd tab) or view their entire line of mobility products including videos showing the products in use.